The majority of items sold on eBay are aboveboard. But sometimes eBay finds out about listings that are either illegal (in the eyes of the state or federal government) or prohibited by eBay’s rules and regulations. In either case, eBay steps in, calls a foul, and makes the item invalid. eBay doesn’t have rules and regulations just for the fun of it. eBay wants to keep you educated so you won’t unwittingly bid on, buy — or sell — an item that has been misrepresented. eBay also wants you to know what’s okay and what’s prohibited so that if you run across an item that looks fishy, you’ll help out your fellow eBay members by reporting it. And eBay wants you to know that getting your listing shut down is the least of your worries: You can be suspended if you knowingly list prohibited items. Prohibited lists the items that may not be sold on eBay under any circumstances. Restricted lists the items that may be sold under certain conditions. Potentially Infringing lists the types of items that may be in violation of copyrights, trademarks, or other rights. You may not even offer to give away for free a prohibited or an infringing item, nor can you give away a questionable item that eBay disallows; giving it away doesn’t relieve you of potential liability. Click the Policies link, which is on the bottom of all eBay pages. You arrive at the friendly eBay Rules & Policies page. Scroll to the Prohibited and Restricted items link and click. You are presented with the lists and links that help you decipher whether selling your item falls within eBay’s policy boundaries. Sometimes an item is okay to own but not to sell. Other times the item is prohibited from being sold and possessed. To complicate matters even more, some items may be legal in one part of the United States but not in others. Or an item may be illegal in the United States but legal in other countries. Because eBay’s base of operations is in California, United States law is enforced — even if both the buyer and seller are from other countries. 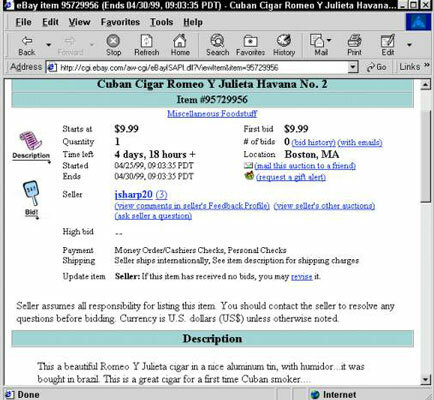 Cuban cigars, for example, are legal to buy and sell in Canada, but even if the buyer and the seller are from Canada, eBay says “No permiso” and shuts down sales of Havanas fast.